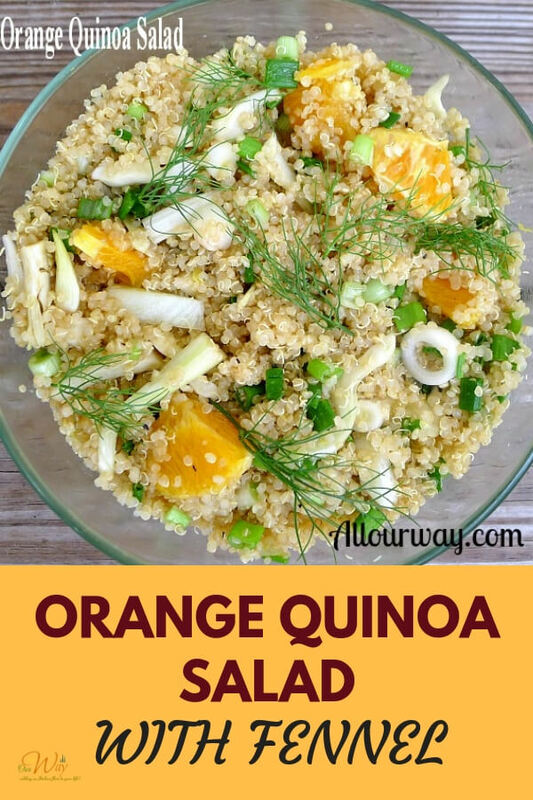 This Orange Quinoa salad is so easy to put together. The citrus fennel salad stores well and the flavors are very fresh. It makes a perfect picnic salad because it transports easily and you don’t have to worry about it spoiling like some other type picnic foods. The fennel gives the salad a nice crunch and the anise taste of the fennel with the sweet citrus of the orange makes this side a good accompaniment for the pork that we are serving. . . .
. . .but it would go just as well with chicken or fish. This salad comes together very quickly! and of course the quinoa. No fancy ingredients to go out and purchase. 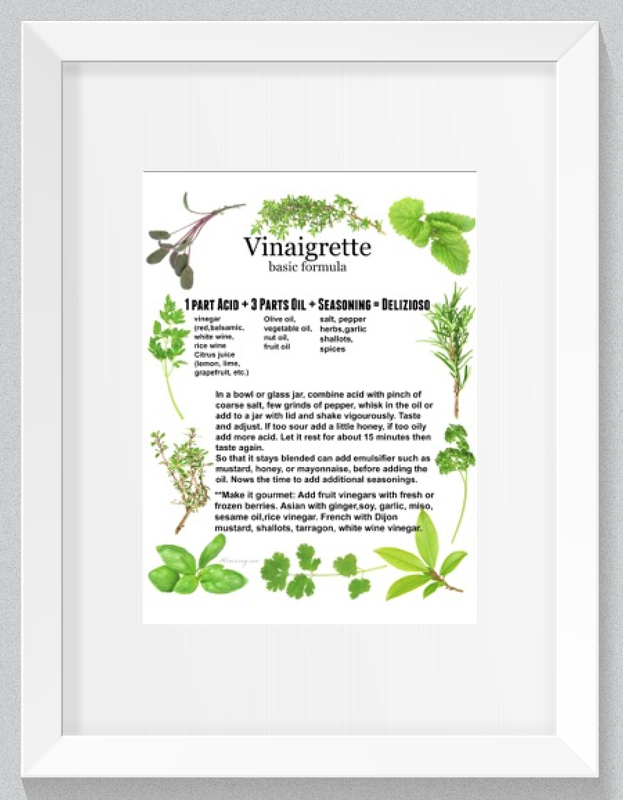 You can store this in the fridge for several days and it keeps nicely. Now, for my Honey, a salad and meat are not quite enough. I am including the picture of his meal that night. We had sautéed spinach with porcini mushrooms — that red stuff you see on top of the spinach is his hot sauce. I did tell you that he likes his food hot. He has a habit of slathering most of his food with our hot sauce. That post will be at a later date. Thank goodness he didn’t put the hot sauce on the Orange Quinoa Salad. 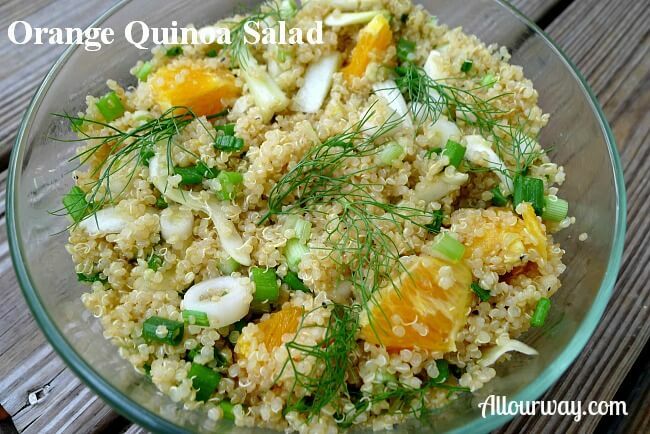 This salad is terrific any time of year. Be sure to try it out! 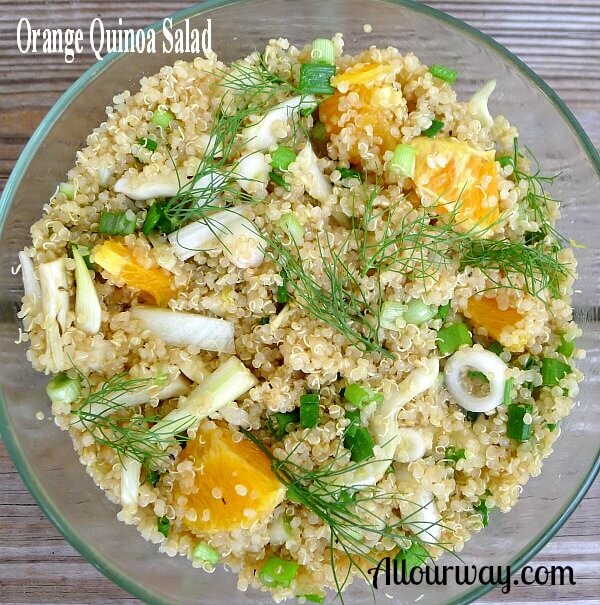 A citrus salad made with quinoa, orange, fennel and scallion. Delicious for a picnic or a side along pork, chicken or fish. Cook quinoa in simmering broth, covered, about 15 minutes, let cool. Toss with chopped scallions, the sliced fennel bulb, the segments from the orange. Mix the olive oil, orange juice, salt and pepper together in a small measuring cup then add it to the salad and mix thoroughly. Let rest about an hour so that the flavors can meld. Top with fennel fronds and the crumbled goat cheese. I removed the white membrane on the orange with my very sharp zester/peeler and then I cut the orange into segments. Note: Recipes and content from ©2014-2018 All Our Way are copyright protected. Please do not use content or recipe without prior written permission. If you want to share the information, please link to this post. Grazie. This looks like such a delicious salad with gorgeous texture. Perfect as a Thanksgiving side dish. Thank you, Denay! It is so good – could also be a light lunch. 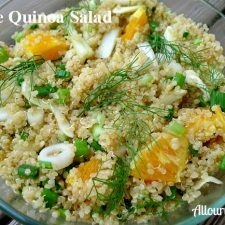 Love this light citrusy salad, perfect antidote to the comfort eating that takes place at this time of year! It is so easy to make! 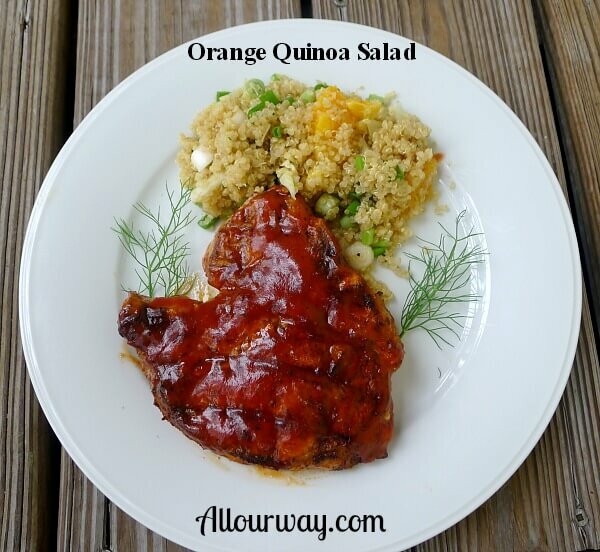 I like how thei orange quinoa looks, too. And you are right – the flavors are so fresh for a fun getaway! I really enjoy quinoa salads. The quinoa is so good for the body. This salad sounds delicious! I Love quinoa very much but i don’t make it as often as I should. This looks so wholesome and hearty. So easy to make too. I can’t wait to try soon. You got some gorgeous shots of this yummy, healthy salad! I love using quinoa, it’s so good! This salad is nothing show of beautiful! 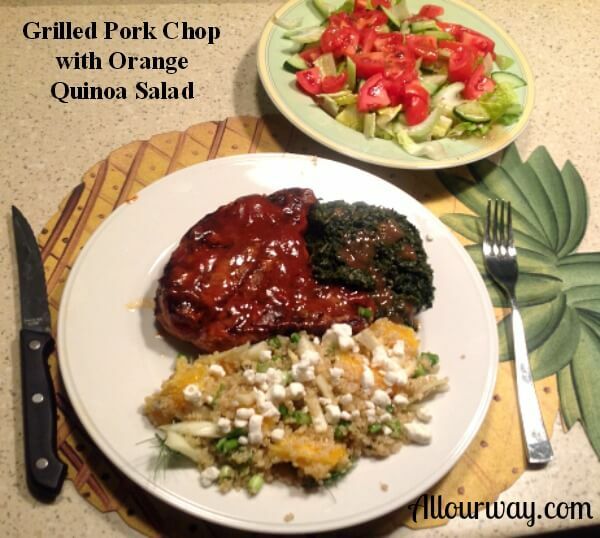 I love the flavor combination, and the addition of goat cheese- yes please! This would be delicious in the summer and winter months. Thank you, all the flavors do combine beautifully. I love quinoa salads with sweet and savory notes like this one – I actually had something similar for breakfast today because I’m weird with food like that haha! So good! Wow, what a great salad recipe. I love oranges, but I rarely use them in salads. Your recipe sounds interesting and very tasty. I want to try. Hi, Dan! Hope you do give it a try. The combination of orange and fennel is delicious. I have never eaten this grain. I hear and see many recipes for it but never ventured to making it. I love that you put an Italian spin on this! Insalata and orange sound great ! Hi, Claudia! It’s really very good and it is so nutritious. It’s easy to make and can take on the flavor of whatever you add to it.